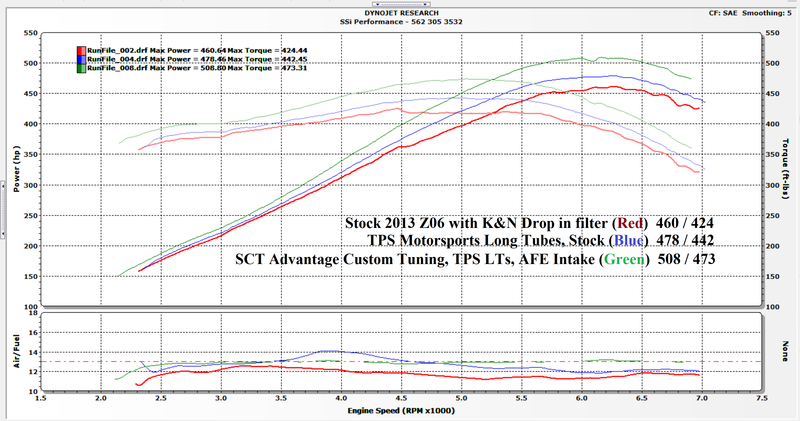 Comments Off on Stock C6 Z06, with TPS Motorpsorts Long Tubes, with AFE Intake and SCT Custom Tuning. The best runs with each one. Video Inside. These are the final results with testing products on our C6 Z06. These were with TPS Motorsports Long Tube Headers, AFE Intake, and SCT Custom Tuning. 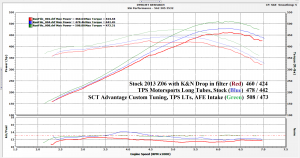 We did 2 runs bone stock, 2 runs with bolting on the TPS Motorsport Headers, then custom tuning with a AFE Intake using SCT Custom Tuning software. The dyno sheet is the best of each run and are we are very pleased with the results. A Special Thanks goes out to Ben at Prodigy Automotive & Fabrication for dyno time.